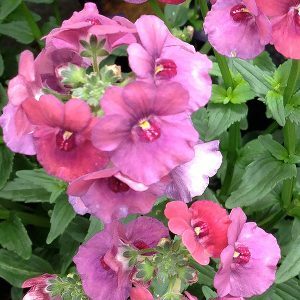 Nemesias have come along way in recent years, new varieties have appeared, many with larger flowers, and more variety in colours available, a wider selection make these showy plants even more attractive to gardeners. These are a long flowering plant, they grow well in rock gardens, hanging baskets, containers and in the general garden border. We think that they are at their best grown in containers, perhaps beneath a taller shrub, hanging baskets, in a mixed planting is also an excellent use for these colourful plants. In cool to temperate climates, Nemesia will flower for months on end, from spring right through summer into autumn. They do like a humus rich moist soil, and in summer, or warmer climates they will benefit from some afternoon shade. Pruning – Cut back lightly after flowering to encourage a second flush of flowers. Fertiliser – A liquid seaweed applied every 3 weeks through the season will be beneficial. Blueberry Ripple – A deep purple flower. Strawberry Ripple – Strawberry Pink to Red flowers. Berries and Cream – Blue and white flowers. 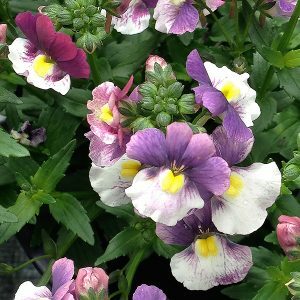 Look for Nemesia at your local nursery.